The electric pop duo of the moment, the Antientertainers from Berlin, send with “Going anywhere” a floating-pounding hymn in the orbit of the club space whose fixed stars flank the dance floors under free sky. Floating and a hand atop the blades of grass, of these biotopes of human state of rapture and detachedness. Just sometimes is relaxing on 44 turn of the path of the everyday life and exchange meager gloomy for blossoming sceneries, there where pop charm in the voice and in minimal House and Elektro skilled club rhythmics pass to itself the hands. Basel’s Jack-of-all-trades and Neopren Records co-operator Steve Cole interprets the summer moment of the original more subtly and with finely dotted sloping situation in the warbling overtones. That of a loose grooving, discreet Steeldrumsounds and softly chipped guitar strings carried On my way is the beauty at the second glance of this EP. Glows at the moment of the day-nightnight-day change like liquid gold in the heart. Gabriel le Mar turns in his Rework of On my way once everything from the right on the left and passes the reins for a free ride on the melodically galloping bassline to the dancers. On the ride one looks with pleasure what goes still so off the path from the stoic, straight tact lines. 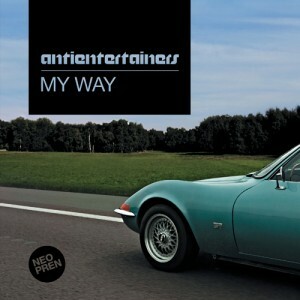 And as extra stars on the MY WAY EP lapel both Antientertainers give two veritable own interpretations of your works for the disciples of the digital who still reclaim fine- grained, skilful postponed mood colours of the sparkle of these tracks.